This powerful top control dishwasher from KitchenAid features the ProScrub Option, offering superior cleaning with 40 targeted spray jets. The jets make quick work of the most stubborn messes. It has a Third Level Rack that’s perfect for long, flat items and frees additional space on the other racks. It also features the ProWash Cycle, which determines the ideal cycle based on load size and soil level. How can you tell when the washing cycle is finished? Is there a light system that goes on during different times to tell you if you are in the washing stage or the drying cycle? There is a blue light displayed on the front while the wash cycle is running, a red light displayed during the dry cycle, and a white light when the cycle is finished. Does this model dry with an element or hot air? Stay away from Kitchenaid dishwashers. Mine only lasted 3 years. Pump motor went and repairs were more than the thing was worth. In addition the thing leaked causing over $6,000 in damages to my home. does this heat it's own water? Hello halekahakai, the KDTE204ESS does heat water, however due to the government restrictions on power consumption, the Dishwasher needs to be filling with water as close to 120deg as possible. The element will then finish raising the water to the target temp. An easy way to make this happen is to turn on the kitchen sink faucet, let it get hot and then turn on the Dishwasher. Hope that helps! 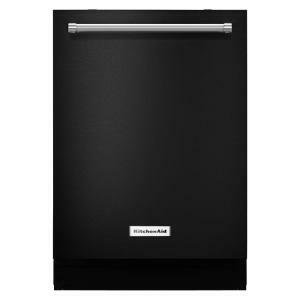 Top Control Dishwasher in Black with Stainless Steel Tub, ProWash Cycle, 46 dBA is rated 4.6 out of 5 by 3743. Rated 1 out of 5 by WifeInTears from Bad product / poorly installed Had this installed in August and will be replacing 4 months later. Incredibly quiet...because there's not much in the way of a food grinder. This means herbs, or a stray coffee ground, will be recirculated and dried onto your glasses. Energy and water efficient...which means the vile rinse water is also recirculated. Decent drying (unlike the European and pseudoEuropean brands)...this actually gets dishes dry...alas, that means anything not cleaned gets baked on. We have tried a number of purported remedies for the defects of this dishwasher (pre-rinsing everything, leaving dishes dirtier to trigger the prosense sensors, adding vinegar, using more detergent, etc.) and are wholly unsuccessful. Lastly, we are not a fan of HD installation (which was also true at Sears in a different house last year); we had to get a second, more professional installer to come out to square things away [literally, HD installed the dishwasher askew] and put in brackets to keep the dishwasher from tipping over. Rated 1 out of 5 by Frustrated from DO NOT PURCHASE THIS DISHWASHER! This dishwasher keeps breaking down. Terrible, terrible quality! So far in the first year we have owned it we have had to replace the sump/motor assembly and now we are waiting for a new circuit board. The local appliance service company says their two distributors show that these circuit boards are not available in the US and are backordered with Whirlpool, the manufacturer of KitchenAid dishwashers. Customer service at Whirlpool is horrible with typical waits on the phone for 45 minutes just to get through to a representative. At this point we have a dead dishwasher and no idea when it can be repaired. Based on our experience to date I will avoid KitchenAide and Whirlpool and buy from some other manufacturer. When we had to have the sump/motor replaced the service man said that he had replaced a number of these parts on this dishwasher model. So the company clearly has a quality control problem but has done nothing to address it. Rated 1 out of 5 by sadmom from Very Disappointed in the Kitchenaid brand Since installed, this dishwasher has never cleaned or dried a load of dishes. I have had kitchenaid dishwashers before, so thought this was a good purchase. Unfortunately, this model is a big fail. No setting, soap or rinse aid combination makes a difference. If there is one magic combination of settings, soap and rinse aid, then why have so many options to pick from? Also, with no dry washer, there is mold growing and odor in the the machine all the time. How is this considered a dish WASHER? I will give this machine a good rating on the noise level. It is VERY quiet, but I feel this is because the darn thing ISN'T WORKING !!!!!!!!! There isn't even warmth in front of or on top of the machine when it runs. By the way, I HAVE run hot water from the kitchen faucet before running the machine. This is so disappointing. I will have to try another brand if this is what to expect from Kitchenaid. Rated 5 out of 5 by Steph from Never thought a dishwasher could work this good! 7 months into my purchase and never thought a dishwasher could work this good. I'm 42 years old, so I've had a few in my lifetime and this is by far the best. Dishes come out spotless every single time. I have small children, so I like that I can use the sanitize feature when someone in the house is sick. My absolute only complaint is that the bottom rack sometimes comes off track easily when it is very weighted down. However, they made the rack so perfect that it's really just a testament to how many dishes I can load. I will live with that and still give the 5 stars with the perfectly spotless dishes that continuously come out every time! I purposely invested a bit more this time in a KitchenAid and am so glad I did!